When it comes to home insulation, the first area that comes to mind is the attic. Airflow within a building moves from ground to sky, naturally pulling conditioned indoor air up and out of a structure. Proper attic insulation helps keep conditioned air inside your home and helps keeps your home comfortable. Keeping conditioned air inside your home can also reduce wear and tear on your heating system and help keep energy bills in line. There are three common methods used to insulate attics – blown-in fiberglass, blown-in fiberglass with air sealing and spray foam insulation. Here’s what you need to know about each. 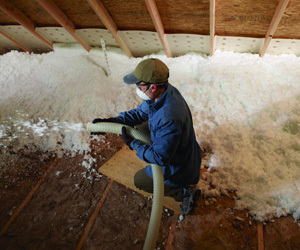 Insulating attics with blown-in fiberglass insulation is a quick and easy way to add R-value. This is a basic method of attic insulation and a cost effective option to upgrade attics of existing homes or insulate attics in new homes. Combining blown-in fiberglass insulation with air sealing dramatically increases a home’s energy efficiency. This method helps keep conditioned air inside the home and adds R-value. In an existing home, attic insulation is removed and penetration points around the attic floor are sealed. After air sealing is complete, a fresh blanket of blown-in fiberglass insulation is installed. In a new home, penetration points around the attic floor are sealed before blown-in insulation is installed. Installing spray foam insulation in the attic of a new or existing home provides optimal energy protection. In an existing home, insulation is removed from the attic and spray foam is installed along the roofline. In a new home, spray foam insulation is installed along the roofline as part of the construction process. Proper attic insulation combined with air sealing is one of the most cost effective ways to save money on monthly energy bills. Wondering if your home could benefit from additional attic insulation? Ready to discuss insulation for your new home project? Contact our office today!